IntraLase Femtosecond Laser has revolutionized the LASIK eye Surgery. LASIK is performed by first creating a very thin layer of cornea and then lifting it up to perform the corneal reshaping via the Excimer laser, and then replacing the flap into position. Although there are few complications with LASIK, the majority of them occur during the creation of the flap. There are two ways to create this flap. The original way, and still commonly performed way is via the mechanical metallic blade microkeratome. This is a device that uses a very sharp metallic blade attached to a turbine engine that oscillates 10,000 or more times per second and moves slowly across the cornea to create a flap. The modern way is to use the IntraLase femtosecond laser. IntraLase is the first company to introduce the femtosecond laser to the US market. The laser focuses its energy at a specified depth to cleave a plane. This technology has evolved just like any other technology since its introduction in the early 2000's. The latest 60kHz IntraLase is so advanced that the surgeons have no choice but to realize the IntraLase advantages in quality, safety, and exceptional outcomes. These are some of the main reasons why the US Naval Top Gun Pilots, Air Force Pilots, and the NASA Astronauts now only receive the iLASIK, IntraLase CustomVue LASIK eye surgery. The following are a few examples of patients of Dr. Ash evaluated with the Visante Anterior Segment OCT from Carl Zeiss Meditec. Below are the images, one day after surgery with 60kHz IntraLase all-laser LASIK flaps performed by Dr. Ash at Northern California Laser Center in Modesto, California. 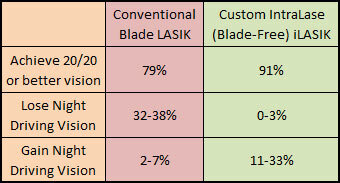 This IntraLase all-laser LASIK flap has a very consistent thickness ranging from 126 to 135 microns. Also note the edge. In the image below see the same edge above but magnified. The IntraLase has the capability of cutting at 70 degree angle down to the plane of the Flap. This vertical edge creates an effect very similar to a Manhole cover... or think of it as a top of a pumpkin. The flap will then fit perfectly back in place. One of the major issues that had always plagued LASIK surgeons with the Metallic Blade microkeratomes, has been the wrinkling of flaps. Since the IntraLase flap fits perfectly back in place, these seemingly minor wrinkles have been virtually eliminated. Below is a Visante image of a patient's cornea that had LASIK with Amadeus II Blade microkeratome. Please note how the peripheral corneal flap (the top orange number) shows the edges of the flap to be as thick as 186 microns, yet the center is only 142 microns. That 44 micron difference may appear minor, but it represents about a 10% gouge in cornea that may destabilize and result in weakening of the cornea. Look carefully at the edge of the flap in the upper image. See the flat yet rough transition that the blade makes. When the flap is placed back in position at the end of the surgery, there is virtually no possible way to make the flap fit back perfectly. As a surgeon that has written papers on treatment of LASIK flap wrinkles, I am excited not to have to revisit my previous research work. IntraLase has virtually eliminated all these complications. 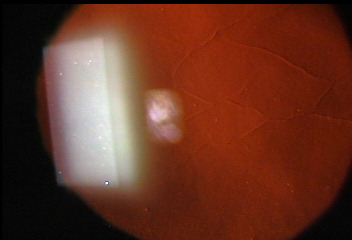 See the image below of a cornea that had wrinkles from Metallic Blade Microkeratome. This picture shows the wrinkles in the metallic blade LASIK flap. These ultra-fine irregularities reduce visual quality. My research works with Dr. Roger F. Steinert (now at UC, Irvine) published in Ophthalmology in April 2004 and with follow-up & expanded data published in June 2007 focus specifically on how to treat these problems. This is an actual photo of a patient in our study. I am ever so glad for IntraLase that has virtually eliminated these wrinkles. The IntraLase has introduced an incredible level of accuracy and precision to the laser vision correction surgery. By creating such a perfectly consistent flap, one can plan on a surgical outcome and expect the outcome to a much larger extent. Additionally this flap edge has revolutionized the surgical outcomes. One of the major problems that plagues all LASIK surgeons with traditional blade microkeratomes is wrinkles in the corneal flap. These wrinkles reduced the quality of vision. The flaps from the microkeratome have a tapered edge that allow for microscopic "slippage" of the flaps that result in wrinkling. The IntraLase creates a perfect 70 degree flap edge that acts much like a man-hole cover, and once surgery is complete the man-hole is placed back into position with perfect fit. Wrinkle and cell growth under the edge of the flap have been virtually eliminated paving the way for absolutely perfect results. IntraLase has advanced the safety level of LASIK to an entirely new level. The result of intense study of LASIK in Top Gun naval pilots clearly show superiority of IntraLase over the traditional microkeratomes. At Northern California Laser Center, Dr. Ash delivers the iLASIK - IntraLase, CustomVue LASIK with Iris Registration - just as performed at the military LASIK surgery centers for the Top Gun pilots, Air Force Pilots, and now the NASA astronauts. The physicians of Modesto Eye Center and Northern California Laser Center are renowned Modesto and Stockton lasik eye surgeons. They are also considered Modesto and Stockton cataract surgery specialists. These physicians treat LASIK Modesto and cataracts patients from their Modesto offices.